Information Requirements: project specifications, protocols or similar that identify what needs to be generated by project stakeholders. Information Requirements can be represented as a set of Document Uses, Model Uses and Data Uses. Digital Deliverables: digital simulations of physical objects and how/when they’ll be constructed or fabricated. Digital Deliverables can either be documents (in digital format -e.g. CAD drawings or a PDF furniture lists), models and/or data sets. Physical Assets: information embodied within real world objects similar to whole facilities, a building, mechanical system, heating unit, or a single pump. Reverse Measurement Activities from  to : the activities necessary to verify or validate digital deliverables against information requirements (e.g. checking floor areas in a BIModel against a client’s spatial requirements). Reverse Measurement Activities from  to : the activities necessary to test and confirm physical outputs against digital deliverables (e.g. checking the placement of duct hangers on site against relevant models or mechanical shop drawings). Reverse Measurement Activities from  to : the activities necessary to capture data pertaining to a physical asset or to monitor the performance of a physical system (e.g. data capture through laser scanning and data monitoring through sensors). 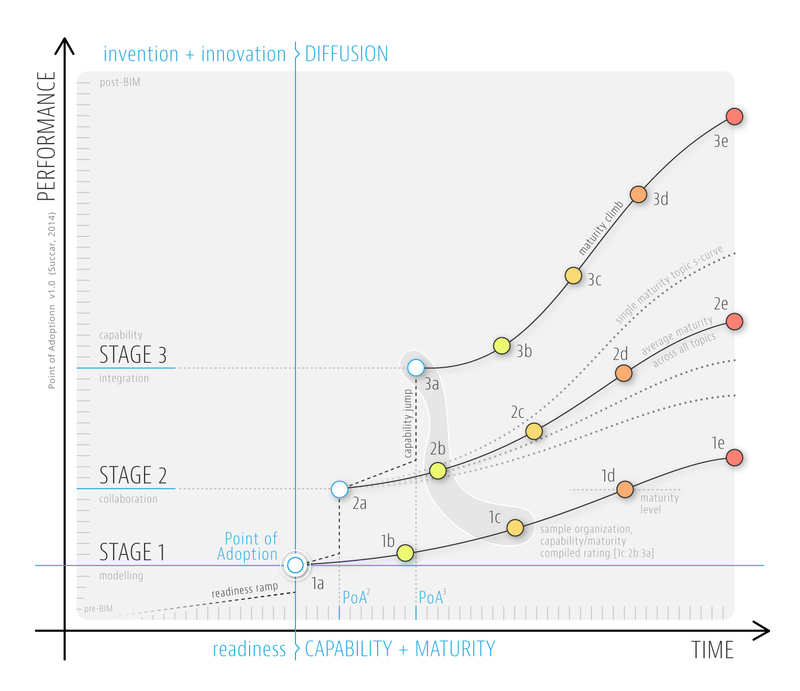 Note: the three Key Information Activities (Prepare [P], Manage [M], and Utilise [U]) will be explained in a future model. Operation Information Management Actors: executing actions applied to Physical Assets (e.g. operating, maintaining and decommissioning). Also these actors can either (a) measure - e.g. capture or monitor - how well a Physical Asset matches with the Information Requirements covering the asset (within the same Information Management Cycle), or (b) measure one or more Physical Assets in order to generate new Information Requirements within a new Information Management Cycle. Actors may overlap and replace each other. 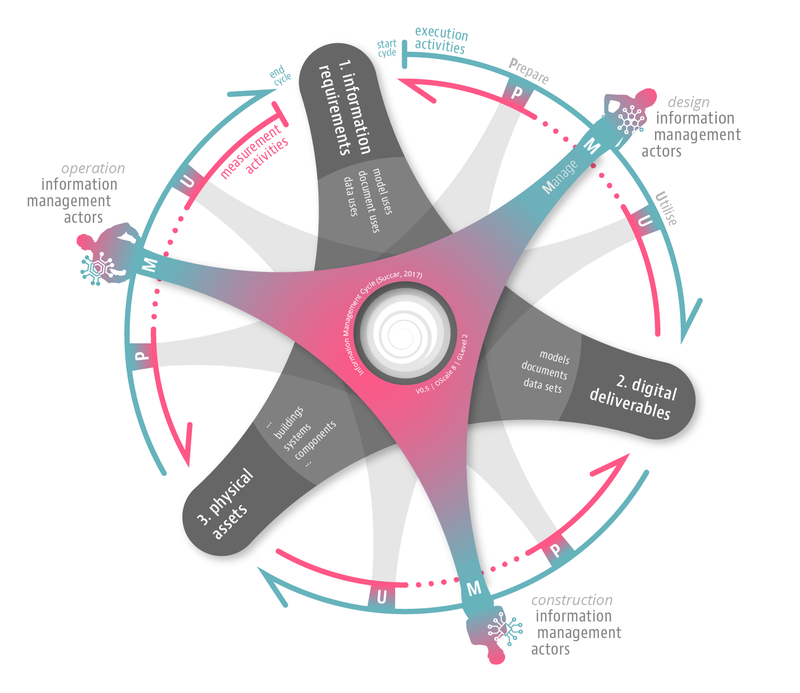 Depending on the current state of technologies, processes and policies within a market, two or even one Information Management Actor may be able to complete all execution and measurement activities across an Information Management Cycle . The following colleagues have provided improvement suggestions to version 0.1 of this model: AProf. Sheryl Staub-French, AProf. Julie Jupp, Ms. Marzia Bolpagni, and Mr. Victor Roig Segura. Thank you to all. 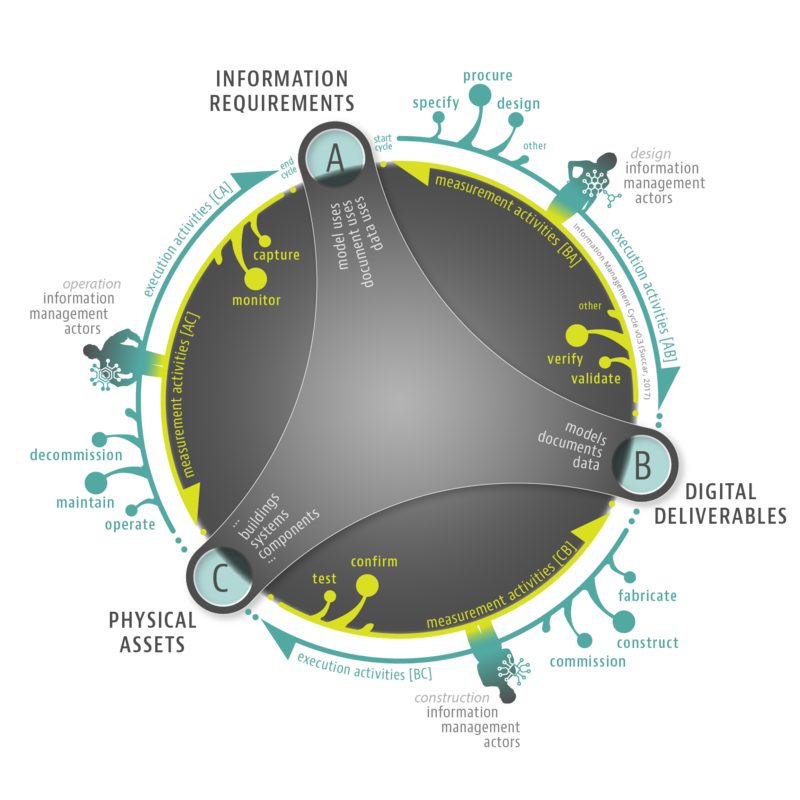 Each Information Management Cycle has a nominal start (e.g. information covering the design of a new physical asset) and a nominal end (e.g. information decimated through the demolition of an asset). However, it is possible and even probable that the same information would persist over a number of Cycles (e.g. through iterative renovation of the same physical asset). Activities are a subset of ‘Relations’ within the Conceptual BIM Ontology. 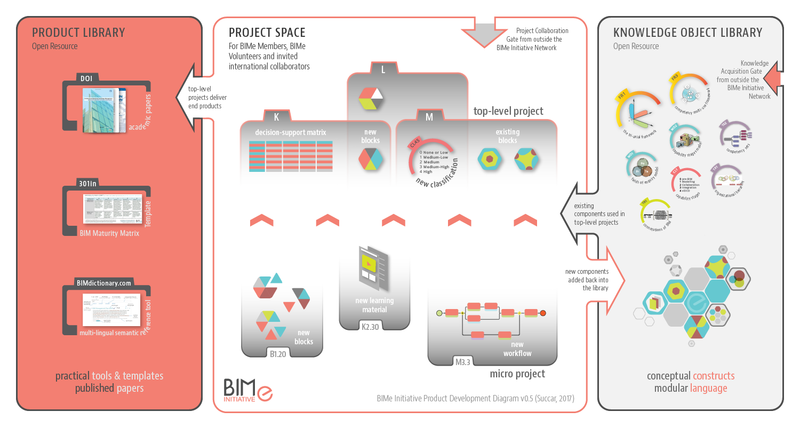 This diagram illustrates the process of delivering a BIMe Initiative Product (a Published Guide or a Software Application): a Top-Level Project must be first launched. Each Top-Level Project typically includes both existing components (e.g. a taxonomy or a classification) and new components. Existing components are (a) selected from the Knowledge Object Library, a public resource available through BIMexcellence.org. New components (e.g. a framework or a software module) are (b) generated by BIMe Members through Micro Projects. Once completed and validated, all components are (c) packaged into a new BIMe Product. Once tested and verified, the new product is (d) released through the Product Library (a webpage on BIMexcellence.org) and all newly generated components are (e) added to the Knowledge Object Library for future reuse. As opposed to the Knowledge Object Library and the Product Library, which are both publicly available resources, the generation of new components and end products are conducted within the Project Space (wiki pages, chat rooms and physical meetings) which are accessible to BIMe Members and invited international collaborators. To understand Conceptual Components (also referred to as Conceptual Constructs), please review the Conceptual Hierarchy and - as an example - how components populate the Research Continuum. Also, for more information about BIMe Initiative products, projects, and how they are managed, please refer to 103in BIMe Initiative Projects. KS5 Knowledge Views identifies the varied ways the BIMe Initiative activities and deliverables can be represented and communicated. 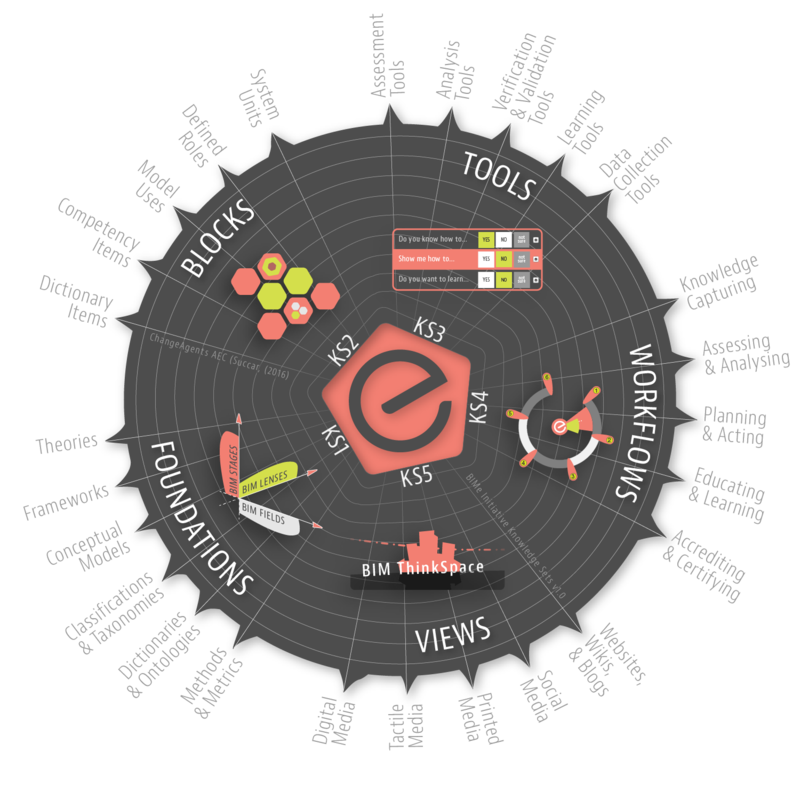 The Knowledge Sets and their subsets form the bases for all BIMe Initiative Projects (refer to 103in); organise the activities of the BIMe Initiative Network (refer to 104in); and allow the development of an expansive Knowledge Object Library. 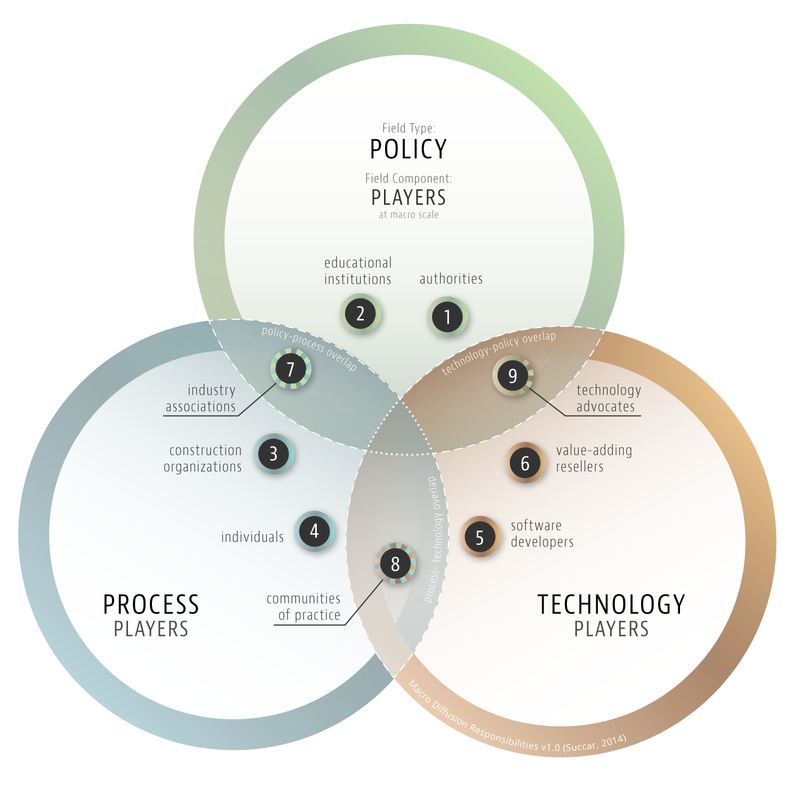 This conceptual model (Figure 1) identifies nine BIM player groups (industry stakeholders) distributed across three BIM Fields (technology, process and policy) as defined within the BIM Framework. The nine player groups are: policy makers, educational institutions, construction organisations, individual practitioners, technology developers, technology service providers, industry associations, communities of practice, and technology advocates. The nine player groups belong to either BIM Field or their overlaps. Pending further research, the tenth player group at the intersection of the three fields is intentionally excluded from this model. Table 1 below provides a succinct description of each player group followed by how this subdivision can be used in evaluating BIM diffusion within and across different markets. Each of the nine player groups identified in Figure 1 includes a number of player types. For example, player group 3 (construction organisations) is composed of varied player types including: asset owners, architects, engineers and project managers. Also, player group 4 (individual practitioners) is composed of professionals, associated professionals and tradespeople. These distinctions between player groups, player types and unique players (e.g. a specific person, group, association, company or university) allow the targeted assessment and comparison of stakeholders’ involvement. The Model Uses Taxonomy organises Model Uses into a tiered structure that allows: (a) collation of Model Uses from across different industries; (b) close alignment with the Competency Taxonomy (Succar et al., 2013 - http://bit.ly/BIMpaperA6); (c) custom use-cases for unique projects; and (d) future expansion towards whole of life cycle classifications. CATEGORY III: Custom Model Uses are a combination of General and Domain Model Uses to respond the non-typical requirements of a specific project. Custom Model Uses are organized under a single Series, Custom Modelling (9000-9990) - e.g. Modelling security systems for a correctional facility. The Model Uses Taxonomy was published as part of BIM ThinkSpace Episode 24 (Sep 9, 2015). There are currently 125 Model Uses across all categories and series (as of March 24, 2016). For a full list, please refer to BIMexcellence.org/model-uses. 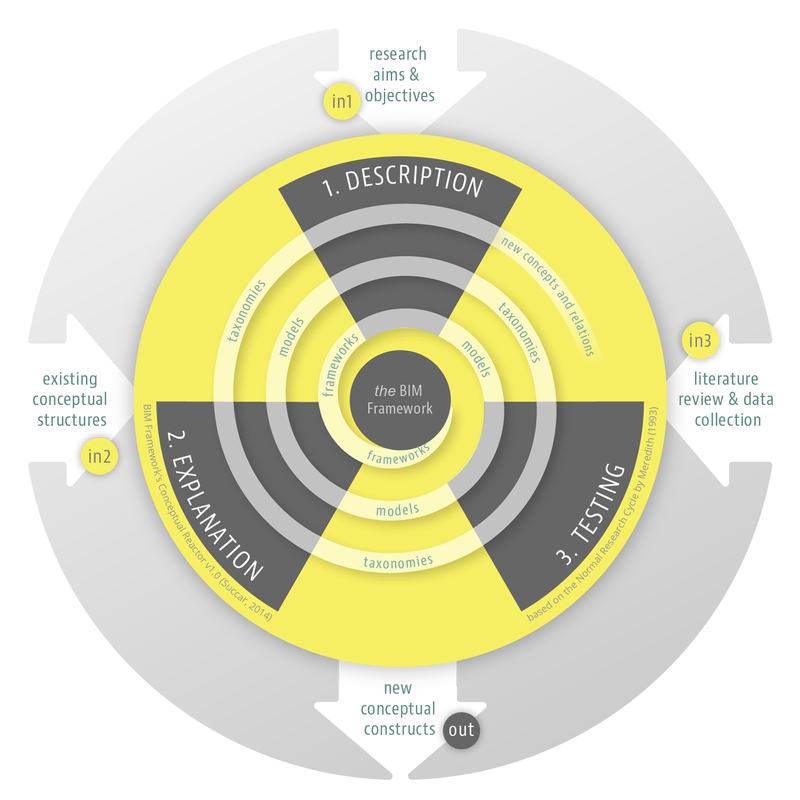 The BIM Framework Conceptual Reactor explains how existing conceptual constructs – terms, classifications, taxonomies, models and frameworks – are used to identify, explain and test new constructs. Third, the Testing Stage inspects explanations and propositions for validity; tests concepts or their relationships for accuracy; and tests predictions against new observables. Model Uses are the “expected or intended project deliverables expected from generating, collaborating-on and linking 3D models to external databases” (BIM Dictionary, 2015). Each Model Use represents a set of defined requirements, specialised activities and specific project outcomes, grouped together under a single heading. Within the Competency Framework, Model Uses are competency topics [Competency Framework> Competency Hierarchy>Competency Tiers (Domain)>Competency Set (Operation)>Competency Topics (9 Topics)] (Refer to Paper A6). Model Uses are discussed in detail within Episode 24 on BIM ThinkSpace. The number of structures supporting a BIM Framework part is proportional to its conceptual strength. IMPORTANT: newer versions of the BIM Ontology are published as a BIMe Initiative resource. As of July 28, 2017, the image above and the information below may be out of date. The BIM ontology is an informal, semi-structured, conceptual domain ontology used for knowledge acquisition and communication between people. It is intended to represent knowledge interactions (push/pull) between BIM players, their deliverables and requirements (Figure 2) as described within Papers A1 and A2 (Succar, Sher, & Aranda-Mena, 2007) (Succar, 2009) and facilitate the validation of conceptual models (Shanks, Tansley, & Weber, 2003). The BIM ontology includes BIM-specific concepts, their relations and attributes which facilitate analysis of domain knowledge (Noy & McGuinness, 2001), enable the construction of a domain framework (Studer, Benjamins, & Fensel, 1998), and support knowledge acquisition and communication (Milton, 2007a, 2007b) (Cottam, 1999) (Studer et al., 1998). Figure 2 below illustrates how ontological objects underlie the BIM Framework. The concept map (Figure 2 - right) is a visual representation of the ontological relationship between the three concepts (BIM Fields, BIM Stages and BIM Lenses); while the visual knowledge model (Figure 2 - left) abstracts these relations into the Tri-axial Model, a simplified graphical representation to facilitate communication. 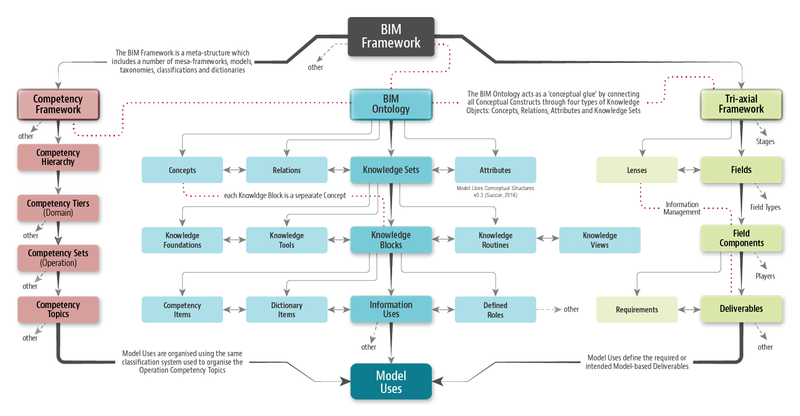 As discussed in Papers A1 and A2, this combination of visual modelling, driven by explicit ontological relations, renders the BIM Framework and its many conceptual constructs more accessible for analysis, modification and extension. Also, as depicted in the Conceptual Hierarchy post, ontological relations enable a ‘conceptual mesh’ linking different types of conceptual constructs: frameworks, models, taxonomies, classifications and specialized dictionary terms. The BIM ontology has been generated by amending and reusing existing ontologies; a process recommended by Noy and McGuiness (2001). The reuse of an existing ontology followed Gruber’s criteria for shared ontologies: clarity, coherence, extensibility, minimal encoding bias and minimum ontological commitment (Gruber, 1995). Based on these criteria, the BIM ontology was first derived from the General Technological Ontology (Milton, 2007a) (Milton, 2007b) and the General Process Ontology (Cottam, 1999). While earlier iterations of the BIM ontology followed source definitions, newer iterations are more closely matched with the conceptual and practical requirements of the BIM domain. Knowledge Sets are higher order Knowledge Objects composed of the other three lower order concepts, relations and attributes. An assessment methodology, a knowledge capture technique, a construction method, a verification routine…. Milton, N. R. (2007a). Knowledge Acquisition in Practice: A Step-by-step Guide: Springer, London.